Kythis has been defeated and the well of souls once again welcomes the tortured spirits of the deceased. The people of Vigil have rebuilt their ravaged cities, honouring the sacrifice of their heroes. It is in this period of abundance that mysterious flashes of energy, exceptional sources of power, appear. Ascension Vigil's rebirth is both a complete game for four and an expansion compatible with Unleashed Souls and Immortal Heroes. A complete game that can be combined with the other games in the range for games with up to six players. Collect energy splinters to benefit from the energizing effects of the game's heroes and artifacts! All the fun of a trading card game without having to buy anything else! Be careful this game is an extension of Ascension: Des Héros Immortels ... + 1 more+ 1 more and cannot be played alone. 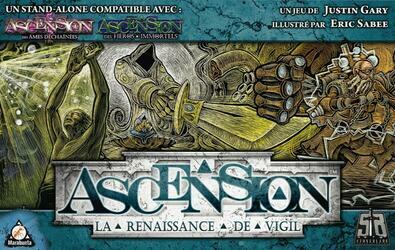 To be able to play it you must have a copy of the game Ascension: Des Héros Immortels ... + 1 more+ 1 more. Contents of the box : 1 game board, 259 cards, 50 crystals, 1 rule booklet.